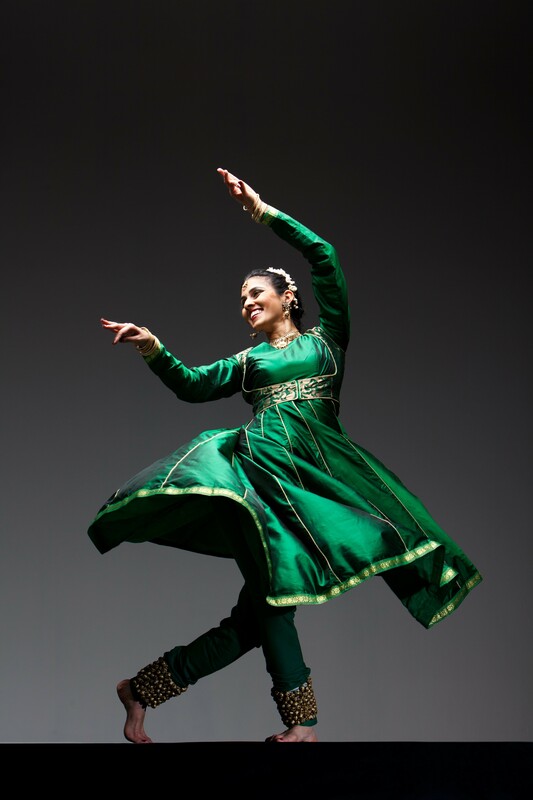 Indian kathak and American tap are two dance styles that run deep in their countries of origin. I’ll leave the analysis up to the historians and ethnographers, but no doubt someone was tapping here when this country was a colony, and apparently kathak can be traced back to the storytelling culture that preceded the Bhagavad Gita. Kathak dancer Rachna Nivas and tap dancer Michelle Dorrance each gave me quick histories of their respective forms when we spoke recently about the upcoming kathak-tap collaboration at Z Space, Speak, which also stars Dormeshia Sumbry-Edwards and Rina Mehta, and features musicians Jayanta Banerjee, Debashis Sarkar, Satyaprakash Mishra, Allison Miller, Carmen Staaf, Todd Sickafoose, and Kara Mack. Both dance styles are deeply integrated with music, and directly serve the rhythm section. Nivas tells me that musical training is central to the development of a kathak dancer. A traditional piece would be a two-hour solo, where the performer would play instruments and conduct musicians as well as tell a story and improvise both movement and sound. She was trained by the legendary Pandit Chitresh Das, who born in Calcutta in 1944, at just the right time and place to participate in the resurgence of kathak. “My guru pushed me to make my own music, sometimes to play one rhythm while dancing an opposing one. He taught with such vigor, holding a mirror up to every student, daring us and wanting us to be better than he was.” Das passed away in January, leaving the leadership of the Chitresh Das Dance Company in the hands of the three co-Artistic Directors: Nivas, Charlotte Moraga, and Seibi Lee. Dorrance, who directs her own much-lauded company,Dorrance Dance, credits her teacher Gene Medler with offering a similar type of relentless and rigorous encouragement and deep engagement with music. Dorrance went on to explain that rhythms of the Indian music are a worthy challenge and she’s still working on counting to 9 and a half. She encourages those of you out there who are interested in musical exploration to come to Speak next week to hear some far out sounds by world class musicians, whether or not dance is your thing. Dorrance and Nivas both expressed deep gratitude to their many dance forebears, and for the chance to serve as both torch-bearers and improvisers. While emphasizing that Speak is a collaboration and not a fusion, they clearly admire one other’s dance styles. They cited a 2004 collaboration between Das and tap dancer Jason Samuel Smith, India Jazz Suites, as sparking their current conversation. I recommend you poke around on YouTube for some of that, but then put down your screen and step out to Speak. It’s not every day you get to see performers of this caliber come up against the raw edge of what’s possible in their storied dance styles. As Dorrance put it, they are each using a distinctive vocabulary to speak in the common language of rhythm. I reckon the rhythms will get a bit wild, and whatever story you might tell yourself about kathak and tap, this performance will show you something different.